Oh well done, you must be so proud that your beautiful quilt inspired these people on the other side of the world! Thank you Cindy, yes I am really happy and proud of all the great work those students did. There is much talent there. This is amazing to see happen! 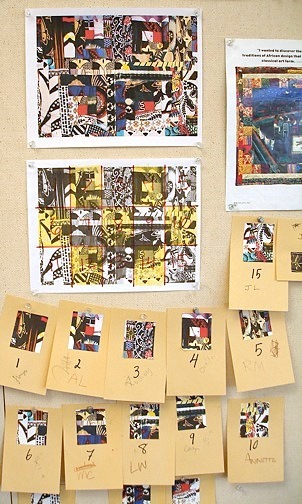 I love the idea of collaborative art in schools. When my kids were young, the PTA had developed a fused glassed project with a local glass artist. 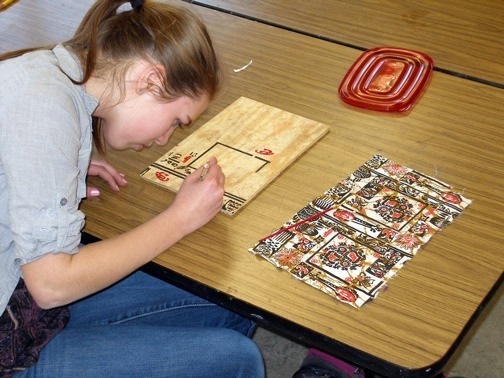 Each child created a tile that was glued on a canoe which became a permanent display in the school library. What an honor for you to have been involved in such project. Specially when your quilt already held a special place in your heart.. Many thanks Sujata. 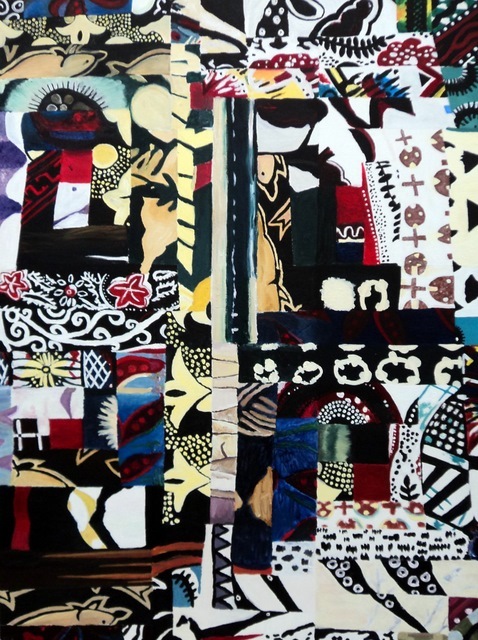 I imagine your own quilts would be a wonderful source of inspiration for this type of collaborative painting. Yes, this particular quilt means a lot to me and I love the fact that others chose it for inspiration. This is great. Your quilt is really awesome! I do love it. It is really nice to know that in the world of Internet time also young people are interested to do things by their hands. My wife is still on beading course and among them there is only one young person, what a pity. What is nice that in Finland there are courses for adults. That is important also from my mind. My post of today shows what people made on glass painting courses during last winter. Lovely to read your words, Matti. Adults’ courses are very popular over here and you can learn a lot in all sorts of activities. I look forward to visiting your post about glass painting courses, one that I had in mind… There is a vitromuseum nearby and I will write a post about it too. Thank you. Your quilt is absolutely beautiful and it’s no wonder it inspired the others. I certainly commend R. Sonka for creating that art project and congratulate the students for terrific work on it! Thanks a lot montucky ! Your words are and will be appreciated 🙂 Minnesota is in your part of the States, isn’t it ? Have a pleasant weekend in beautiful Montana. Minnesota is one of the northern states, but St Paul is about 1200 miles east and a little south of here. Merci croquecamille, j’apprécie ta visite et tes mots. Tu possèdes un autre talent magnifique : créer une cuisine délicieuse ! It is great to see how many people around the world love your quilts – like I do. 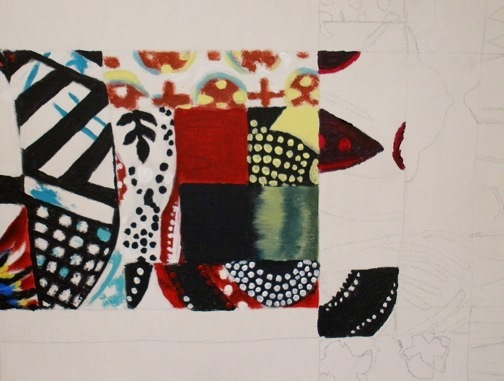 What a wonderful idea this art teacher here has got to work based on the quilt. She must be a very talented and inspiring teacher. Interesting and beautiful post, Isa! Thank you truels. 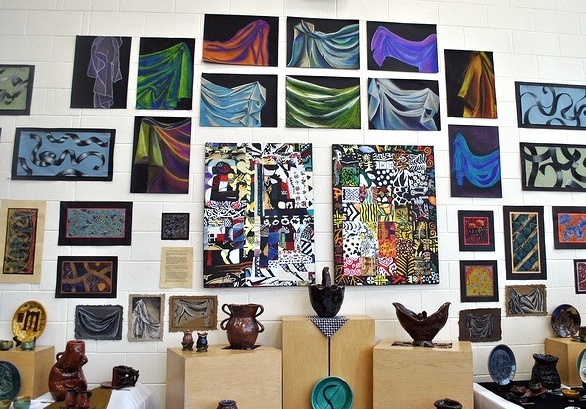 I was so surprised to read about the art teacher´s project. And very happy about its outcome. A wonderful realisation, really. Oui, tu as raison Karen, une grande et belle histoire ! Isa, this is wonderful to see! My wife, Renee, was thrilled to find you and your inspiring work, and was very excited to introduce it to her students and conduct this collaborative project. Thanks for sharing in her enthusiasm, and for being so supportive! Your compositions are amazing and her students were able to create such a magnificent piece because of them. It is incredible how the Internet and the international language of art and design can can link people together from different continents, and result in such beautiful things. Thanks a lot for your wonderful words, Dave. I really appreciate them. 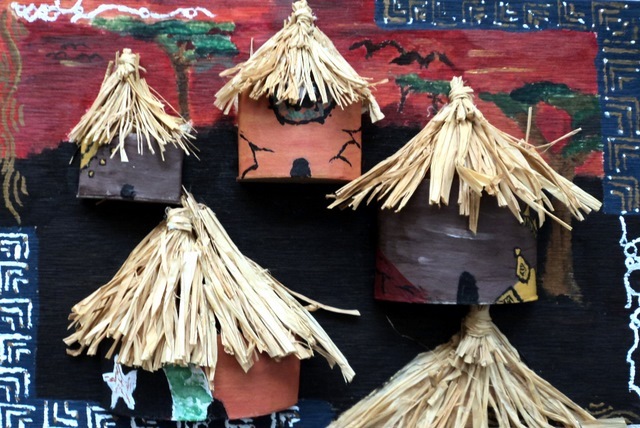 This is a common project and I am so admirative of the artwork Renee and her students created. The correspondences between art and design all over the world are an encouraging sign for all the positive that we are able to do together. No matter what our differences. I enjoyed visiting your blog too. I suppose that the various stones you use for landscape design are from your area ? Very beautiful shades and textures. We make a lot of dry stone walls over here. Wow… those are incredible images. 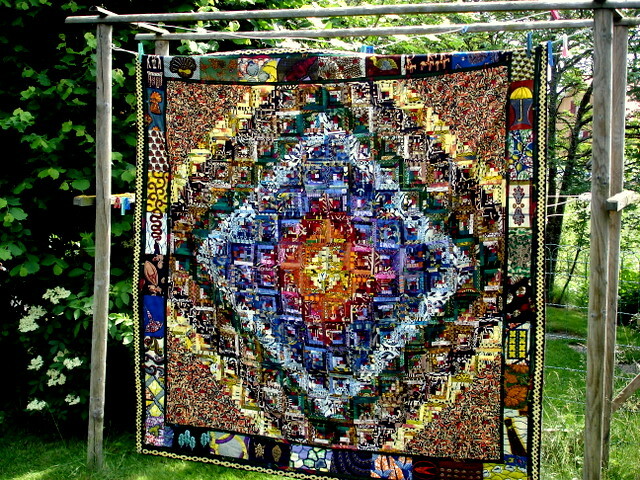 I find it wonderful that your quilt has inspired so many different works of art in this way. What a brilliant idea! Thanks for your visit and words, Reggie. Just like you I find it incredible that this quilt of mine – one dear to my heart, I must say – has inspired such a creative project. Much gratefulness ! I can see why you would be honored, Isa. How delightful that your quilt is continuing to create and teach and inspire others around the globe. I am happy you liked this blog, Kathy. I sewed this quilt with a great pleasure, thinking of all the people or places that were related to the fabrics I was assembling. Isn’t it amazing how anything we do in this way has a kind of inspiration for others ? I imagine writing has the same impact, you surely noticed it with your own blog 🙂 Thank you Kathy. Glorious inspiration and collaboration. It makes me think of the Chinese folklore that a red thread connects us all. 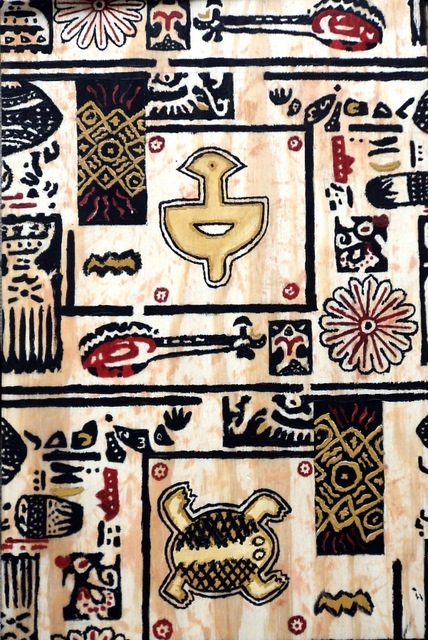 I can imagine this going further to the African fabric makers and beyond this community to inspire a deeper insight into art, culture and travel. Very nice to read your words, Martha, thanks for visiting. I like this idea of a red thread connecting us all in a way or another. For me art, culture and travel are unique paths to bring people together, create deeper links and better understanding of one another. I like your thoughts about it. I love that your quilt making has inspired collaboration because at the heart of things quilts are about community. What an honor Isa. How right you are! Community and “communion” in many ways. Reminds me of Whitney Otto’s wonderful novel “How to Make an American Quilt”. 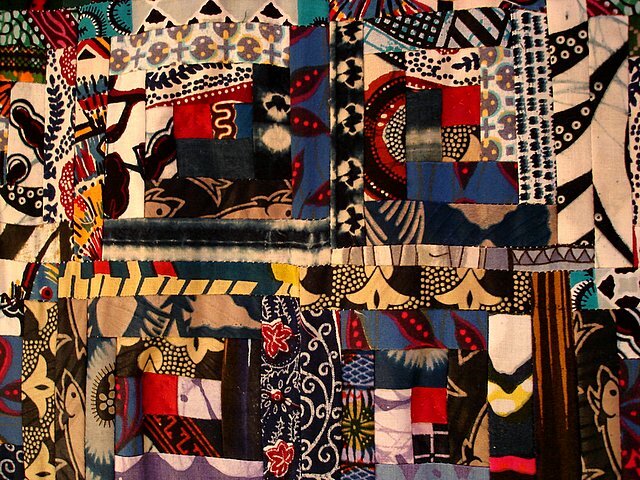 Yes, indeed, I feel honored and deeply touched that my quilts of African fabrics, as diverse as the people I knew there or the places I visited, has touched other people too. Thanks for your words, Sherri. J’ai toujours admiré les quilts et les personnes qui ont la patience nécessaire pour travailler sur un quilt! J’aime beaucoup ce que tu fais et le fait de pouvoir de cette manière encourager des jeunes de cultures différentes, vraiment, comme on dit, l’art et la beauté sont un language universel. Merci Joumana 🙂 un quilt – patchwork de tant de tissus – est comme un lieu de rencontres et d’apprentissages multiples, non ? J’aime tes mots :”l’art et la beauté sont un language universel”. Art and Beauty are a universal language. This is absolutely the best story on the internet. Well done Isa! I love that you are the inspiration for this class and their beautiful show. Thanks a lot Tammy for you enthusiastic comments. 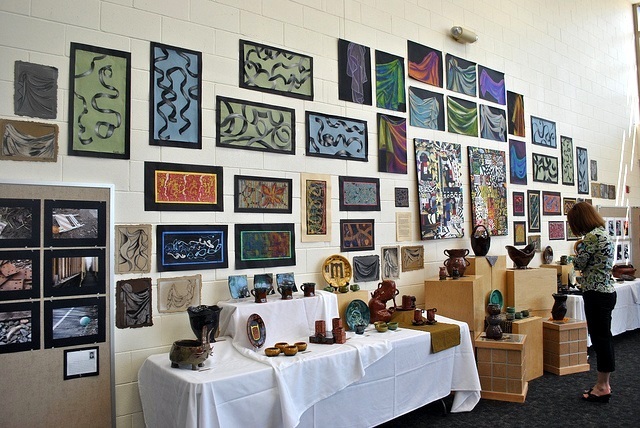 I hope teachers and students will read your encouraging words as they are well deserved for their beautiful art show. Congratulations Isa, this is really a wonderful story about how clever people can make things happen. 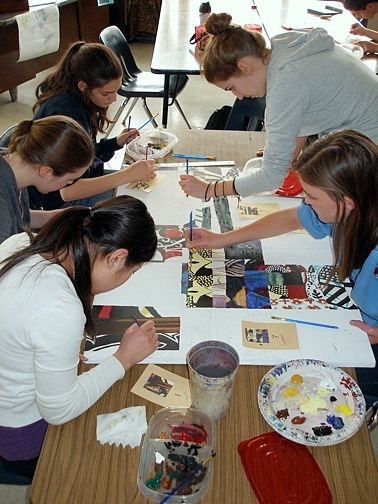 I do understand how happy you must have felt, to see the photos of the students working with your art. It is almost like a growing flower getting buds all the way round. What a lovely comment, Birgitte, thank you ! I like this idea of a “growing flower getting buds all the way round”. Buds like different images and creative interpretation on the same theme. Always different and subject to personal perception. How wonderful! I did see your quilt before and thought then that it was very beautiful. 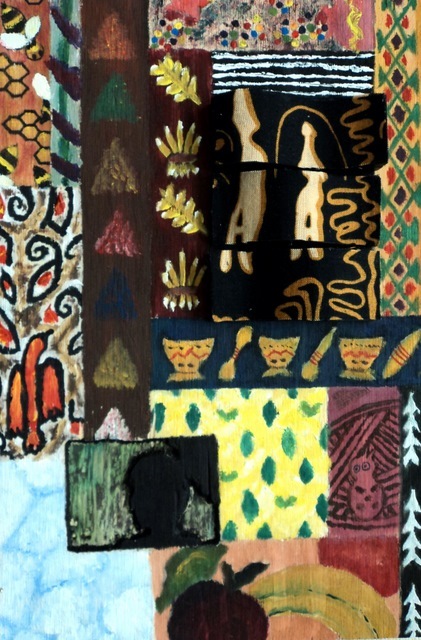 But for it to be the inspiration for this art project and indeed as a foundation for the study of African fabrics is truly wonderful. I know you feel honoured – rightly so, and the students have used it as inspiration to produce wonderful work. Very well done to everyone concerned! And thank you for your lovely comments about my completed embroidery project, Isa! It is a truly wonderful project, you are right, Janice and I do feel honoured and grateful to all who participated in this artwork. Your own Hungarian Embroidery could also be very inspirational for this kind of project. I was looking at it again and trying to imagine a wide field of all kinds of flowers, like the ones you beautifully embroidered. How would they look under the brush of an Impressionist painter ?